What began as an outcast, leper community seventy-five years ago has now grown into Korah, an urban slum with an estimated 130 000 people in the city of Addis Ababa, Ethiopia. To this day people infected with leprosy continue to flee to Korah for treatment and to escape from those who believe that they are cursed. After three generations, leprosy is not the only disease found here; people suffer from starvation, TB, HIV/AIDS and many other preventable diseases. These people have become outcast and forgotten. Those living in Korah are extremely vulnerable. The area is consumed by poverty, leaving many widowed and orphaned. Illness spreads quickly due to scarce and tainted food, filthy living conditions and a lack of clean water. Most who survive do so through begging, prostitution and living off of the city’s garbage dump; a place many orphans call home. Men, women and children spend their days searching and sifting through the trash, desperate to find food or discarded metal and plastic they can salvage and sell for pennies. A committed group of leaders has risen up from within Korah. These are the ‘boys of the trash dump’ who have grown up to become the ‘Men of Korah’; a beacon of light and hope to those living there. As young teens, these men were unexpectedly transformed by words they had never heard before – that “Jesus loves the leper!” This forever changed their lives. As time went on they began to demonstrate this love by serving the hurting people of their community and eventually Great Hope Ministries, an Ethiopian NGO, was formed. These men are a testimony to God’s love and His power to break the yoke of poverty; bringing hope and a future to the people of Korah. Loosening the yoke of extreme poverty in Korah, Ethiopia and bringing hope to those who live there. Hope for Korah has been established to take action towards breaking the cycle of urban poverty for families living in Korah. We do so through partnership with Great Hope Ministries because we believe that they know their community best. Jointly, we have developed a number of projects, including a breakfast program for malnourished children and a family sponsorship program for destitute families. 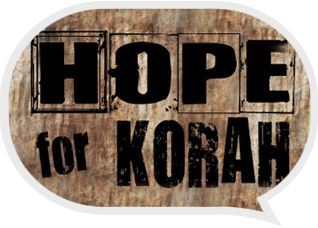 Together we are committed to serving and empowering the people of this community with the love and compassion of Christ, bringing much needed “Hope for Korah”.